What is the Andromeda Embedded Services Platform? Andromeda addresses the fundamental software requirements of devices making use of the Internet in a seamless and non-intrusive manner. With the ubiquity of low cost wireless interfaces now available, a plethora of devices once unable to be networked due to cost or infrastructure limitations are now able to have a network connection. Although hardware costs and infrastructure barriers are fast disappearing, how these devices are actually able to make use of their new networked functionality needs to be addressed. Andromeda solves this by providing a means for the device application software to make general service calls to their hosts. With this service ability in place, devices and hosts are able to share and act upon requests without explicit knowledge or interaction by the end user. Sensors, monitors, or controllers with automatic storage and retrieval of captured or generated data. Robotic or device artificial intelligence (AI) enhancement via server or cloud computing. Digital still cameras or video players with automatic upload or streaming of pictures and video. Remote monitors who need greater functionality or automation over web page serving. The combined use of each of these major functions allows automated communication to occur, as well as provides the means to integrate into a device's software stack and the host's IT infrastructure. The device's applications are able to make network system calls by calling an Andromeda Client service API. 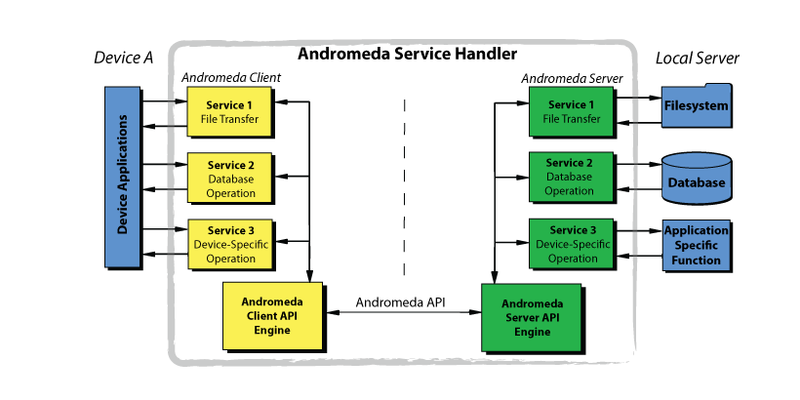 From there, the Andromeda Client breaks down the service request into a series of Andromeda APIs that are sent as an HTTP data stream to the web server which is running the Andromeda Parser. The web server then performs the desired network operation and sends the appropriate replies back to the client. These replies are also sent over HTTP, as part of the HTTP response packet, and decoded directly by the Andromeda Client. Multiple clients can be handled by a single server, and a device may have both an Andromeda client and server running concurrently. Support for HTTP1.0 and 1.1, including persistent or chunked responses over IPv4 or IPv6. All functionality contained; no special server settings or features are required. No new TCP/IP ports are required to be opened. Based on a unique technique to frame general commands and data as part of the HTTP data payload. Special paging mode supplied that allows the server to be the communication master if desired. Optimized for low bandwidth, low network latency usage. Runs as symbiotic engines in both the Andromeda Client and Parser; output to the host server application suite is dependent upon the input of the device client application's requests. Standard calling mechanisms on the client (OS service call or linked library), and interfaces to the host (file system write, database interface, etc). Network Physical Layer Agnostic. 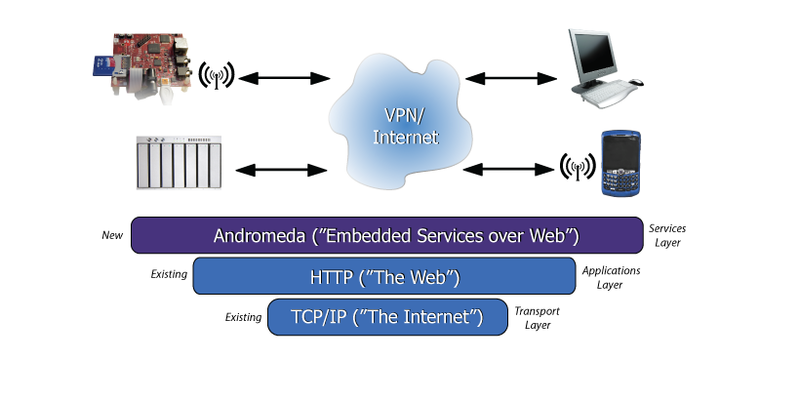 As the bridge and control point between a device's application software layer and the physical network connection, the software architecture of Andromeda is such that any physical network medium, be it cellular (3G/LTE), WiFi (802.11), ZigBee (802.15) or physical (Ethernet) is supported. Enhanced Security. As Andromeda runs within an existing web infrastructure environment, all security enhancements in place carry over to Andromeda. Further, the Andromeda API allows for the inclusion of unique identifiers in each packet sent, adding another security mechanism above standard web practices. Extremely Flexible. With the unique ability to support a general command and data packet over HTTP, any sort of device command can be initiated across the network. The web becomes a general data pipe without the processing overhead, server and infrastructure requirements of XML-based solutions. Easy Integration and Maintenance. As a web server module, Andromeda Parser plugs directly into the existing web IT infrastructure. Andromeda Client is completely OS and processor agnostic and requires no special libraries or hardware functions. A key benefit of Andromeda is that great care has been taken to avoid dependencies on any other system function or third-party tools and software. Andromeda is able to run in the deepest of embedded systems, and as such, conveniences provided by a full high-level OS stack or third-party tool may not be available. Any ANSI C compiler (such as GCC) with Sockets API support will be able to compile both Andromeda Client and Parser. If database operations are desired on the server side, Perl with DBI support is required on the server. Andromeda creates a Services-Over-HTTP layer in a similar vein as enterprise class XML-based methodologies such as SOAP or REST. However, what separates Andromeda over these XML methods is how both commands and data are passed over the web. Through a patent-pending method, Andromeda is able to embed commands along with data inside a standard HTTP data stream. This is possible as Andromeda is not simply just a services platform, but a total client and server software solution. With Andromeda and the design services provided by Galixsys Networks, any embedded system can have enterprise-class service-over-the-web capability. Please contact one of our technical sales representatives for additional information on Andromeda.